The hit parade of great new products from the NAB Show 2018 just keeps coming. From tripods and camera support to live streaming and portable switchers, there was truly something great for everyone. There’s some great gear on this list, so let’s get going! 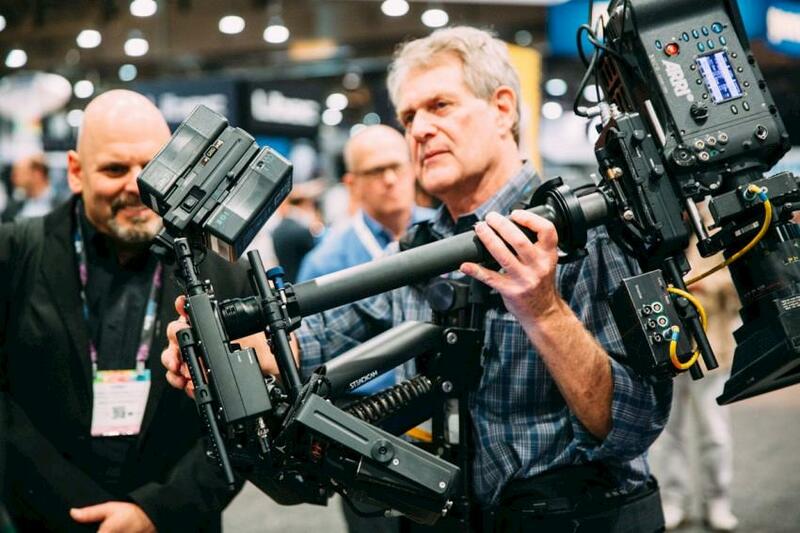 One of the highlights at Vitec’s NAB 2018 booth was the Flowtech 75 tripod from Vitec brands Sachtler and Vinten. 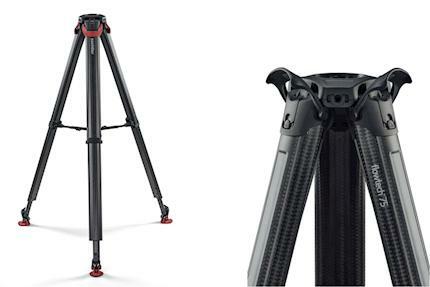 The carbon fiber tripod is a fresh take both in its look and in the way it’s operated. I got a first-hand look at how straightforward and speedy it really was by extending and setting up the Flowtech 75 in an array of different heights both on even and uneven surfaces. A really big change is how the leg brakes are located at the top of the sticks. This is great for one-handed or quick setups. The Flowtech75 also felt very light and would be comfortable to carry around for an extended period of time. One very cool feature that I really liked were magnetic locks that keep the legs together when carrying them around eliminating straps that you lose or that get in the way. The Flowtech75 also has a mid-level detachable spreader, rubber feet and a capacity of 20kg (44lb). 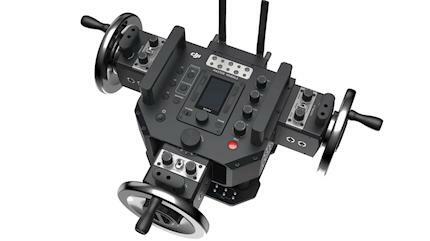 DJI Master Wheels and Force Pro Both devices are aimed at professional camera operators and are priced accordingly. 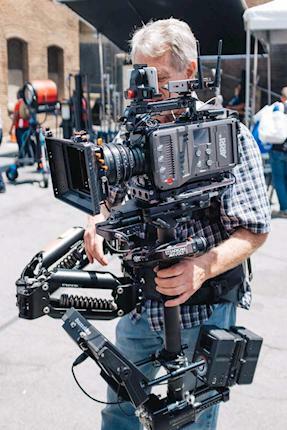 They allow for very precise and cinematic movement of the DJI Ronin 2 and Ronin-S gimbals. The Master Wheels and the Force Pro are high-end devices with significant price tags, $8,000 for a three-wheeled version of the Master Wheels and $1,200 for the Force Pro. They will ship in June 2018. The Steadicam M-1 Volt is a tool that provides M-1 operators with horizontal stabilization, giving them the ability to easily transition between fully manual and auto assist modes. Weighing only two pounds, the M-1 Volt seamlessly integrates into an existing M-1 sled, providing greater opportunity for content creation without jeopardizing stability. The Steadicam M-1 Volt was a recipient of one of our coveted NAB Awards of Excellence this year. The Production Bot portable switcher was one hot product being shown this year. Let’s just put it this way. If I knew I had to do a ton of live or streamed productions on the fly with little to no setup time, this bad boy would be in the mix. The Production Bot Switch is an extremely portable "switcher in a suitcase" and comes preinstalled with vMix live streaming software. With server-class specs in a carry-on size, the Production Bot Switch can be used as a live production studio, mobile editing station, or a DIT station. Cut cameras, run replays, integrate custom graphics, record program and camera isos, all in one unit. It can be used in any broadcast environment including 4K, varied frame rate, as well as with external audio over XLR or ¼”. It also includes built-in encoding to many of the popular streaming platforms such as Facebook Live, Periscope, Youtube and Twitch. Additionally, Production Bot, the mobile production studio platform, has released a new controller for its Switch systems. The Production Bot Control Surface adds tactile controls and a traditional production switching interface to all Production Bot switchers. It features 12 backlit programs, preview and overlay buttons that work with the vMix interface. It also offers four downstream delegation buttons to quickly activate overlays, as well as a T-bar for smooth manual transitions between sources. For customized control, there are user-assignable function buttons that can be set to vMix shortcuts, including complex macro-styled trigger events. If you are in the market for fast setups and doing live multi-cam, you owe it to yourself to check out the Production Bot Switch. If you haven’t checked out Litepanels Gemini yet, what are you waiting for? Litepanels has just updated an already solid offering with a firmware update. The new Gemini firmware includes a new Lighting Effects mode for adding the following effects: TV, emergency lights, lightning, fire, hue burst, paparazzi, fireworks, party lights, pulsing, square and strobe. All effects are fully customizable, giving users the ability to control rate, color, depth, and other factors to craft a unique look. Effects can be saved to presets for easy recall, and the presets can be saved to a USB drive for easy porting to other lights – ideal for rental customers who need to streamline setup for their rented lights. In addition, the firmware itself can be updated from a USB drive, a process that takes about 20 seconds. In addition to the new Lighting Effects mode, the 2x1 Gemini soft panel includes four additional lighting modes: Correlated Color Temperature (CCT) mode for bi-color (daylight to tungsten) with +/- green adjustment; a new RGBW mode that allows independent adjustment of red, green, blue and white; HSI (hue saturation and intensity) control for full-color and saturation control; and Gel mode, providing the ability to dial up a variety of popular gels. All modes are accessible through an easy-to-use, intuitive LCD menu interface, and they offer users complete intensity control with smooth dimming from 100 percent to zero without any color shift. Read my review of Litepanels Gemini for a more in-depth look. When I saw these two products announced together during a LiveU show from the LiveU booth at NAB, I was really excited. Putting these two products together as a bundle made way too much sense. High quality streaming capability combined with live high-value production quality. Did you catch the word quality? LiveU Solo enables broadcast quality remote streaming using cellular bonded encoding for the best possible quality streams. This is going to become increasingly important as the demand for excellence in quality streaming of entertainment and sporting events continues to rise. Sling Studio is super easy to set up and use multi-camera live production solution that lets you switch between cameras and smartphones wirelessly using an iPad or Mac. 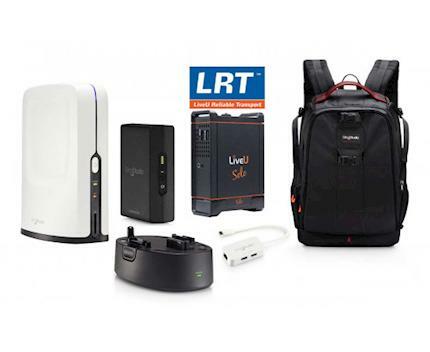 Together LiveU and Sling Studio deliver a reliable, powerful, easy to use remote solution that will fit into many live production situations. Read my full review of the Sling Studio for a closer look at the specs. Hopefully that gives you another taste of some of the great products at 2018 NAB. In our next installment, I will finally get a chance to cover some exciting audio news along with VR, plus more cool gear you might have missed. Stay tuned. Mark J. Foley, MBA BA is an award-winning producer and director and the Technology Editor for ProductionHUB.com. He is on a mission to provide the best in new equipment reviews, along with exclusive analysis and interviews with the best, the brightest and most creative minds in the entertainment and production business. Have a suggestion for a review? Email Mark.